StumpGrinder: Allocations where we document the allocations to each ETF over time. StumpGrinder suffered losses in May and June. We moved to cash in late June. Here’s a blog explaining why we believe StumpGrinder (and other strategies) were down during that period. We’re planning a reentry to the market, but with a change up in assets. Here’s a post covering some of the equities we’re considering for the new portfolio. Just looking at performance after market open. Our new portfolio is up 15 bps more than the old one would have been. Nice to see validation that optimizing and rebalancing helps, even if it is just a small glimpse. 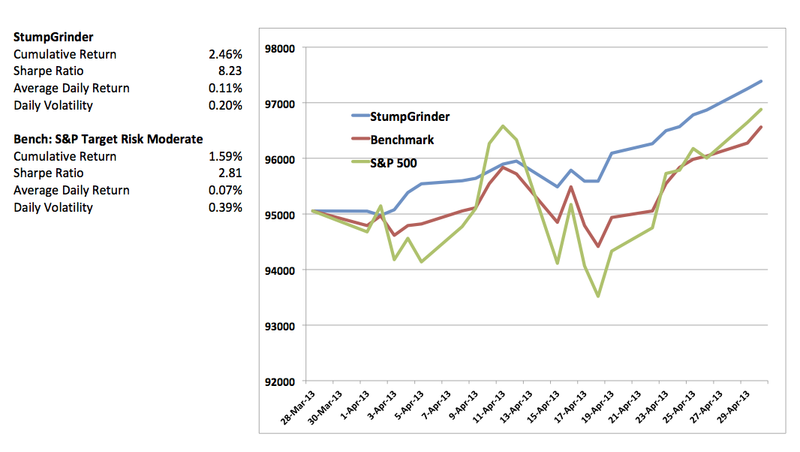 StumpGrinder performance for April 2013 compared to our benchmark and the S&P 500. Highlights: We’ve completed our first month with the new ETFs. Prior to April we were using a similar mix, but only 4 ETFs. We’re now using 12. Mid-month we ramped up our leverage to 2x, so we’ll be seeing slightly higher volatility and return (we hope). Our volatility is still less than 1/2 the market’s so we could potentially consider even a bit more leverage. Monthly performance: Performance for the month was good. In terms of cumulative return at 2.46% we outperformed our benchmark and the S&P 500. We also outperformed both in terms of low volatility and high Sharpe Ratio. New benchmark: We’ve switched from the S&P 500 to a more appropriate benchmark on the advice of one of our advisors. We will certainly refer to the S&P 500 from time to time, but our key benchmark will be the S&P Target Risk Moderate Index, SPTGMU. It’s a more appropriate benchmark because it represents a similar balance of fixed income, equity and international exposure. According to S&P: “It provides significant exposure to fixed income, while also providing increased opportunity for capital growth through equities.” For comparison purposes we use the ETF AOM to represent the index because the ETF value history includes total return information (price + dividends) that is not available with the index by itself (price only). 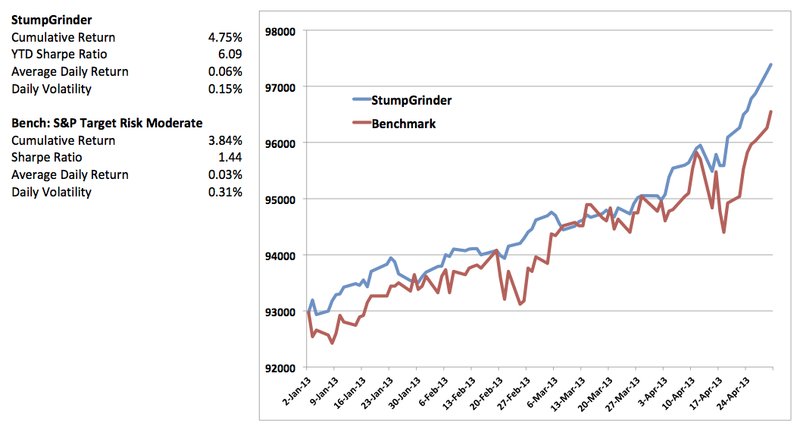 2013 year to date performance for StumpGrinder (blue) versus our benchmark (red). You can read more details about the benchmark here. YTD performance: Our year to date performance continues to excel with a remarkable Sharpe Ratio of 6.09. We will be surprised if that ratio remains that elevated, but we will certainly take it! We’ve outperformed our benchmark YTD in terms of cumulative return (4.75% versus 3.84%), volatility and Sharpe Ratio. The S&P 500 outperformed us in terms of cumulative return. But now that we’re levered up to 2x, we’re hoping to give the S&P 500 a stronger run for it’s money in terms of total return, while continuing to outperform in terms of Sharpe and volatility. StumpGrinder (blue) versus S&P 500 (red) in performance month to date, April, 2013. The month of April has provided a great opportunity to illustrate StumpGrinder’s performance in a volatile market. The market (S&P 500) has been up as much as 2% and down as much as 1%. 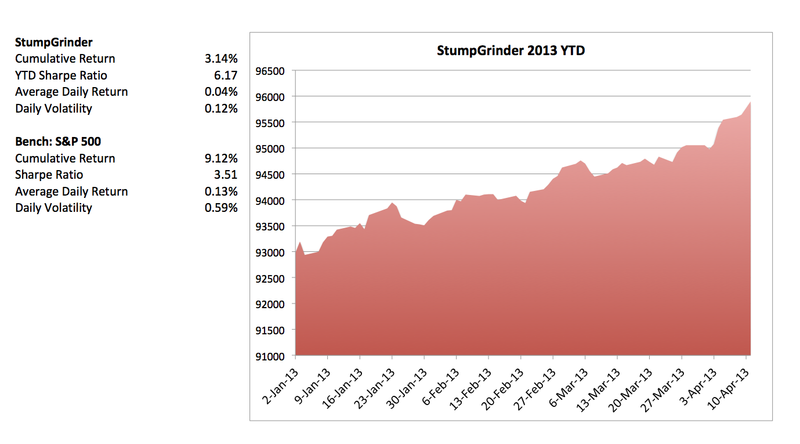 StumpGrinder has followed the market a bit, but overall has survived the volatility well. We close out this week up about 1.1% for the month, and 3.38% for the year. The market is down 0.37% for the month, but up 9.18% for the year. The market is doing very well YTD. We’re OK with the lower return YTD because we’re getting it with much much less volatility. However, we’re levering up now to 2x, so we expect to see higher returns now going forward. We’ve had an amazing week for the market: 4 days of record highs, with a slight drop today. StumpGrinder has had a good week also. Here’s a chart showing StumpGrinder versus the S&P 500 over the last 2 weeks. These last two weeks provide an opportunity for a discussion of risk versus reward. Consider the question: Over the last two weeks, which performance is better: StumpGrinder or S&P 500? I suspect many of you will answer that the S&P 500 has done better because it has provided the highest return (1.35% vs 0.90%). But how might you have felt on April 5th when the S&P was down nearly 1% and StumpGrinder was up 0.5%. The point is that over the last two weeks the S&P is up overall, but compared to StumpGrinder it is volatile and perhaps more risky. Also, many pundits expect a market correction downward. Here’s another consideration: Based on this chart, would you feel better putting your mom’s retirement account into a portfolio that performs like StumpGrinder or a portfolio like the S&P 500? Investment professionals consider this tradeoff in terms of a reward/risk ratio, where “risk” is defined as volatility. It is called a Sharpe Ratio (named for William Sharpe, a Nobel Prize winning economist). In terms of Sharpe Ratio, StumpGrinder is doing much better than the S&P 500 over these two weeks. We’re going to begin, soon, to leverage StumpGrinder, so I hope we’ll see our strategy provide strong returns, and low volatility. Four days ago on Monday April 8, 2013, we launched StumpGrinder . We’ve had four up days since that time. The market has also been on an incredible tear, hitting record highs each day. So, why not just buy the market? If you were to buy the market, I’m assuming you’d buy the SP 500 ETF: SPY. We’re using that as our benchmark, and it is up over 9% YTD. That’s great performance, but it is also volatile. The short answer is that, right now, the market is the hare, and we’re the tortoise. We’ll catch up when the market “correction” (drop) occurs, and lots of folks think that’s coming soon. The longer answer is that StumpGrinder includes a wide variety of asset classes. Overall, we expect all of these assets to increase in value. On any particular day some of them go up, some go down, but they balance each other out, so we see smooth upward returns. On significant market down days the non-US stock holdings will prevent a large loss. Yeah, Sharpe Ratio is really 6.17, but Sharpe Ratios over short periods of time are often exaggerated. We’re not expecting that for the entire year of course. We’re including the performance of our previous strategy from January 2, 2013 until now in our performance reports. That strategy was very similar to the one we’re trading now, but it included only four securities: SPY, GLD, BOND, BAB. We’re expecting even better things for the new StumpGrinder. Tucker Balch manages a fund with long positions in GLD, EELV, HILO, XLU, VYM, USMV, SPLV, BOND, HYD, IEI, SHY, VCIT. Wouldn’t showing a comparison of predicted performance versus true performance be more appropriate than measuring against the S&P500? One fund is full of bonds and low volatility stocks, so of course it’ll be less risky than the S&P500, but that not saying much…. There’s not really a prediction other than the back tested performance. The most important factor there is Sharpe Ratio, which evaluates return AND risk. In that sense the performance so far is better than the back test. You should learn about Sharpe Ratio. Can you further explain how you “ramped up our leverage to 2x”? 2x leverage explanation: The portfolio value is $97,000. I borrowed another $97,000 and purchased more of all the ETFs in the same ratios. So now the ETF portion of the portfolio is worth $194,000 and the cash component is -$97,000. Total value of the portfolio is the same. I have to pay interest to the broker on that $97K at a rate of 1.66%/year. See my recent post on this blog about leverage. first of all, thanks for sharing this experiment with us, it’s nice. I think that is an effective method, thanks for sharing. I believe this is similar to what Bridgewater and AQR do.